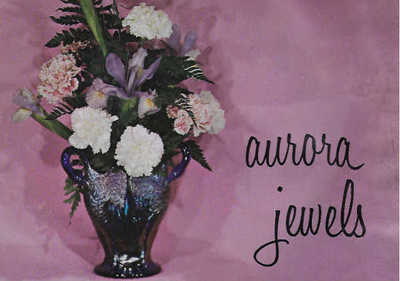 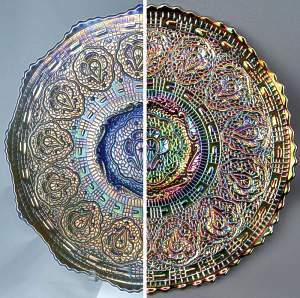 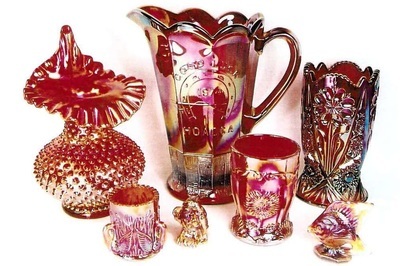 From the 1950s, Classic Carnival Glass began to acquire its own identity, thanks to early pioneers like Marion Hartung and Rose Presznick and early Carnival Glass writers / researchers such as Don Moore and Sherman Hand. 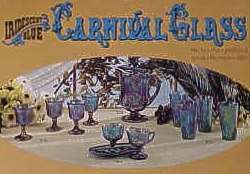 At around the same time, several glass manufacturers realized there was a niche in the market for contemporary versions of the old, Classic Carnival. 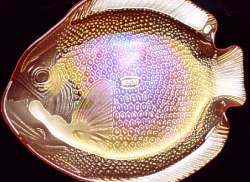 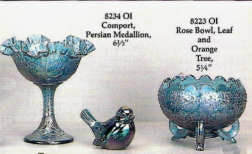 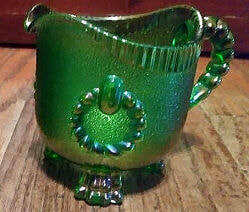 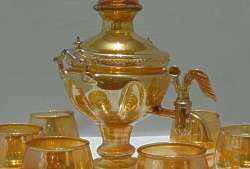 The Imperial Glass Company in Ohio and Joe St. Clair in Ellwood, Indiana were two of the first manufacturers to introduce new Carnival Glass, as a collectible, to their line in the 1960s. 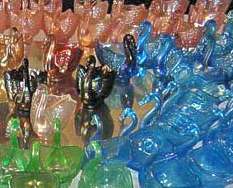 Other glass manufacturers soon joined in. 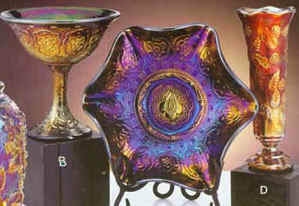 Boyd, Indiana Glass, Mosser, L.E. 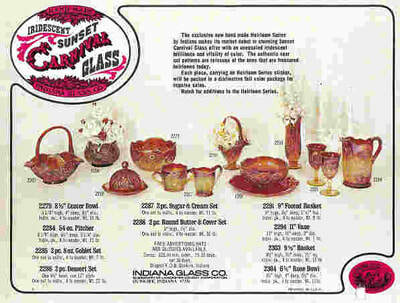 Smith, Summit, Westmoreland, Viking, and more. 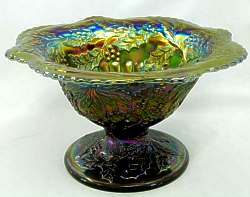 Most recent is the Northwood Art Glass Company, established in 1998. 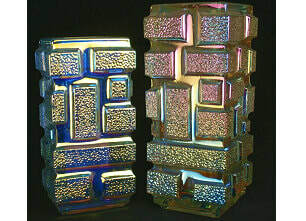 A club devoted entirely to contemporary Carnival Glass was established in 1975 - Carnival Glass Encore, the inspiration of Dorothy Taylor. 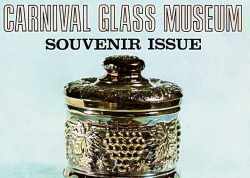 It grew and thrived, inspiring a generation of collectors to seek out and acquire the new Carnival Glass. 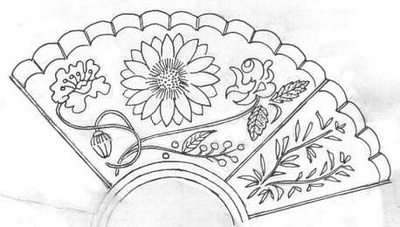 The majority of contemporary Carnival is comprised of new issues: new moulds, fresh patterns, inventive shapes and designs, wonderful and exotic colours. 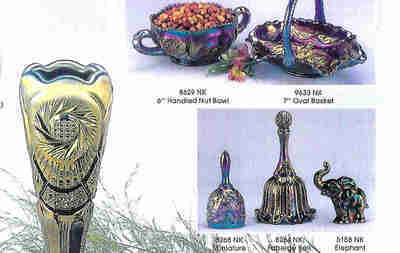 Many of the new items have been made in limited quantities, affordable at the time of release but rapidly increasing in value as time goes by, and today, they can be found all over the world. 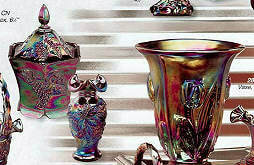 A whole section of our book "A Century of Carnival Glass" is devoted to contemporary Carnival Glass. 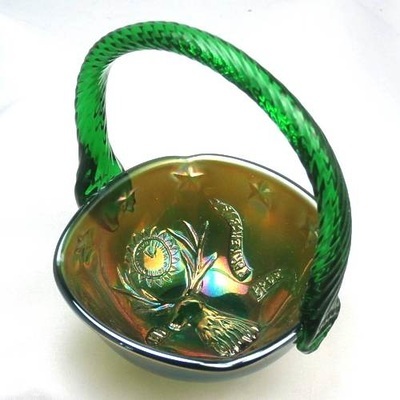 There is a phenomenal range of contemporary Carnival Glass available: many older moulds are still in production, and new colours and shapes are still being made today. 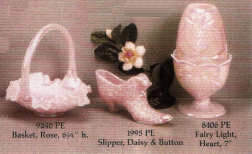 As factories such as Imperial, Westmoreland and (most recently) Fenton, have closed, moulds have changed hands, often several times! 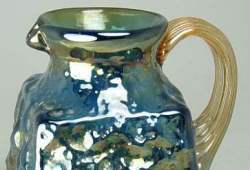 New patterns, new colours and new shapes have continued to emerge. 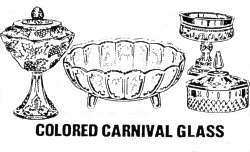 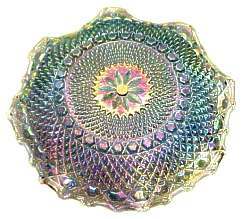 Confusingly, some old trademarks remain on some examples of Carnival Glass that is still being made today. 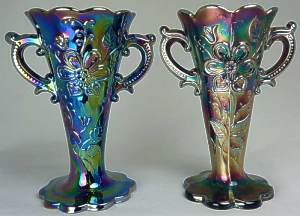 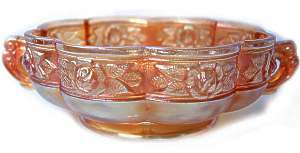 Fortunately most manufacturers took pride in their glass production, and although quite a number of Classic Carnival patterns have been re-issued, they are most often trademarked/signed (Fenton and Imperial virtually always is) and are usually in different colours or shapes to the original Classic examples. 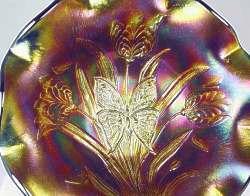 There are exceptions, of course, and collectors are also urged to read as much as possible about fakes, re-issues and reproductions. 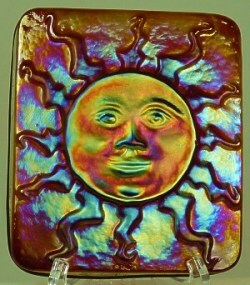 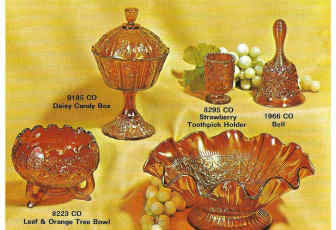 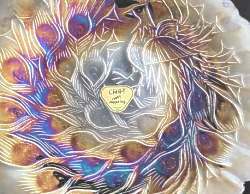 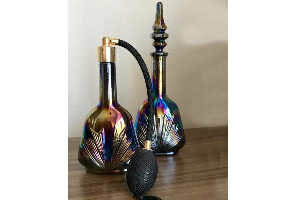 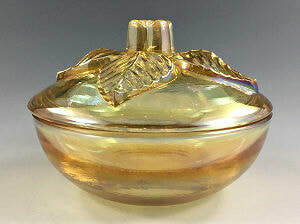 We have major features on each of these vital areas of interest to all collectors of Carnival Glass. 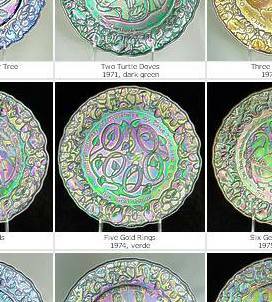 Don't be mislead - click on the images below to find out more. 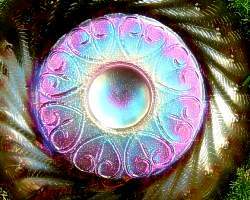 Information is power! 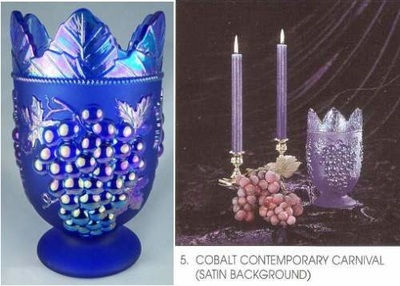 Read and see more about Contemporary Carnival Glass - click on any image. 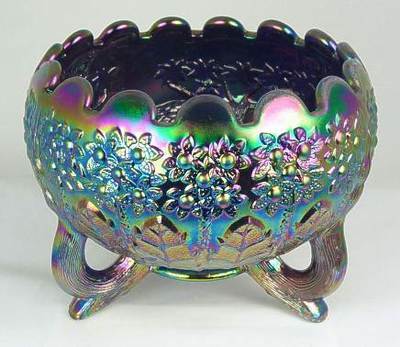 Fenton Cobalt Marigold - amazing! 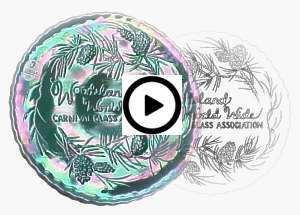 Indiana Harvest - Stop the Press! 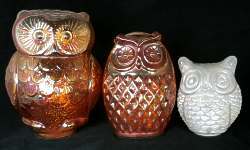 Owls - What a Hoot!